I’ve often said that you can’t write a first scene until you’ve written the last scene, at least not a final write. You have to know where you’re going to know where to start from, know what happens in the final scene to introduce it in the first scene. So now that I’ve written the final scene (not finished the book, I just wrote that scene), I can go back to the first scene and do some of the massive cutting and shaping it needs. I’m looking at it in several ways, but the one that’s most crucial, I think, is seeing how it bookends..
Bookending just means making making the climax fulfill the promise of the beginning scene in both content and structure. No, this is not a rule, it’s just a way to look at your beginning and your ending and make sure you didn’t start out heading for Maine and end up in Texas. One of the keys to bookending is balance. In my first scene rewrite, there’s now a lot more emphasis on how wrong everything is in Nita’s mind, stating her goal to eradicate the wrongness on the island, and in the last scene, she faces down the antagonist and says, “You’re the source of all the wrong,” and ends it. Put another way, if the first scene is turning the screw to tighten the intensity and focus of the story in which the protagonist’s stable life is made unstable, the last scene unscrews the intensity so the protagonist can return to a stable state. Another key is structure. 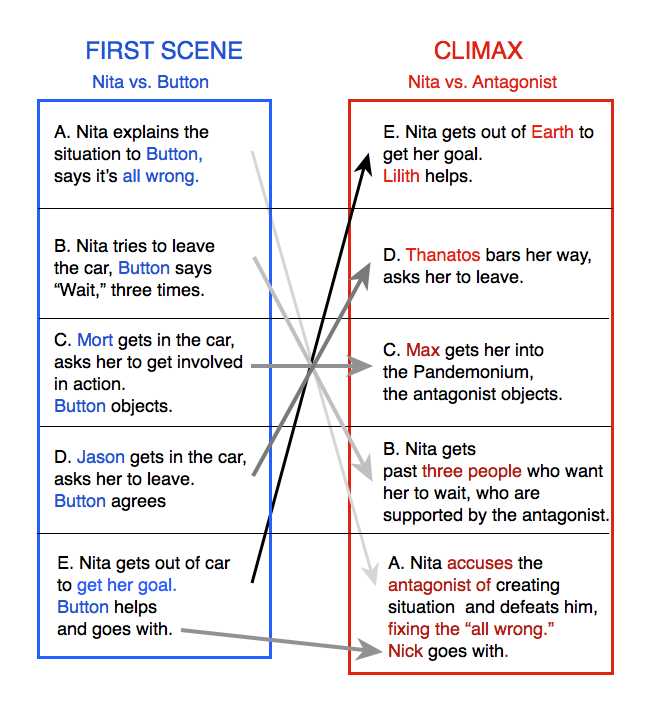 At the beginning of the first scene, Nita tries to get out of the car three times and Button stops her. At one point in the climax, Nita blows past three people who want to stop her in Hell. That sequence in the climax is a fraction of the length of the same sequence in the first scene, but it’s still an echo of that beginning. Do I expect that people will actually remember a three-peat from four hundred pages earlier? Consciously, no, but a reader’s subconscious is an amazing thing, and dotting i’s she doesn’t remember reading means she won’t be left with any vague loose ends to the story. • And a big key is parallelism. At the end of the first scene, Nita tells Button to leave and get a new partner, and Button surprises her by saying no, beginning the partnership. At the climax, Nita says good-bye to Nick,, who’s now the Devil, on the assumption that she’ll be leaving Hell by herself, and Nick surprises her by saying no, foreshadowing a new partnership. So here’s balance, structure, and parallelism in a chart I did while I was figuring out how to bookend this (you knew there’d be a chart). Hi Jenny, glad to read you are getting it all together. I feel sure you are close to sending it to your editor (she said hopefully) and (fairly) soon I will be holding a copy in my hot hands. Hint it would make a great Christmas Present for you doting fans. It takes about a year to publish a book, so if I’m lucky and I pick up speed, it’ll be out in 2018. I love all of your craft posts. I also am super-excited to read this book one of these days. Hah! I write my comment on The Flash finale and then read this. I don’t know if TV gets the benefit of a re-write/edit once the finale is written. I think the premiere has already aired by then. That, or the writers always knew they wanted to end up in Texas, and aimed for Texas, but realized they weren’t going to get there on time so took these timehops forward except the audience feels it every time we do that lurch forward? Or I am tired and sick and need to go to bed already. Oh, I loved this part of the McDaniel course when we wrote our endings and compared them to our beginnings! We did not, however, build a chart. I LOVE the chart. As I’m nearing the midpoint on my current WIP, I’m close to the point of writing the placeholder last scene to see whether I’m still headed for Maine. Charts are great for analysis, just don’t use them as maps. I’m skipping reading book posts till after I read the book, but I came here to say the image of anything Portal delights me. I want to believe you love GlaDos as much as I do. She’s one of my favorite villains of all time. I really enjoy your craft lessons. Thanks for this one. Such the image, screwing and unscrewing the intensity. Love the image, very helpful with first and last scenes. Knew already about bookending and parallelism because you’ve taught us so. And thank you.